Preserved in the royal archives in Sweden is a letter addressed to Albrecht, Archbishop of Mainz and dated the 31st of October 1517. It was written by a young priest who was then professor of biblical studies at Wittenberg University. His name was Martin Luther. The tone of the letter is deferential, befitting a lowly Augustinian friar writing to the most senior churchman in the province, but the content is uncompromising. Luther was voicing his concerns about the current teachings and practices concerning ‘indulgences’ (by means of which the length of time a deceased person’s soul spent in purgatory could be shortened) and he enclosed with the letter a treatise he had written on indulgences together with a list of ninety-five theses (points for discussion), asking that the Archbishop ‘examine my disputation theses, so that he may understand how dubious a thing this opinion about indulgences is, an opinion that those preachers disseminate with such complete certainty’. The sheet of parchment containing those now iconic theses was not preserved along with his letter, so we have no idea if the list was hand-written or printed. What we DO know is that they became – in the words of Peter Marshall – ‘one of history’s least likely best sellers’. As the touchpaper for a religious revolution, the story is a little lacking in narrative drive: a priest writes a letter to his Archbishop attaching a treatise and a list of discussion points. All hell breaks loose. The version of events favoured by popular history features a hammer, a church door and, for greater dramatic effect, a supporting cast of astonished/disgusted/shocked (delete whichever is not applicable) onlookers who can all read Latin fluently and immediately grasp the significance of what they are seeing. Peter Marshall’s intention in writing 1517 is not, however, to debunk the potent myth surrounding the posting of the Theses but rather to analyse what we actually know happened and then examine the way in which subsequent generations and cultures have interpreted, manipulated and/or distorted events to suit their own narratives – and why. He begins by dedicating two chapters to a concise explanation of what indulgences were, the events surrounding the posting of the Theses (referred to resoundingly in German as the Thesenanschlag) and the immediate aftermath of the publication – however it came about – of those theses. He then leads us through the following months, years, decades and centuries, and the stages by which a largely imaginary event took centre stage in the story of Luther and the revolution he never intended to initiate. Although Luther himself continued to look upon October 1517 as a seminal moment in his life, following his death (in 1546) the Thesenanschlag was barely, if ever, mentioned. For 150 years or more his defiant appearance before the imperial diet at Worms and his public burning of the papal bull (issued by Pope Leo X and threatening him with excommunication if he didn’t recant) were considered to be far more significant events. It was only in the 19th century that All Hallows’ Eve began to move into the spotlight as the moment the Protestant Reformation was born, and Luther and that hammer became shorthand symbols of a fuzzy-felt concept of ‘liberty’. Unfortunately, they also became symbols of anti-Catholicism and knee-jerk, thick-eared nationalism which – along with his unalloyed anti-Semitism – made Luther a natural pin-up boy for Hitler. Martin Luther was a complex, hot-headed and conflicted man with genuine concerns about the church he had dedicated his life to, who was alarmed by what he had inadvertently set in motion but utterly powerless to stop it. He would have been astonished and probably appalled to know that 500 years after he sent those 95 Theses to Archbishop Albrecht, both he and they would still be remembered and revered, not to mention demonized, copied, lampooned and satirized. From Coretta King saying of her assassinated husband (who was named for Luther) that ‘he nailed his demands to the door of City Hall, as Martin Luther had nailed his Ninety-five Theses to the door at Wittenberg’ to The Cluetrain Manifesto offering Ninety-Five Theses for the conduct of marketing operations in the Internet age, the Thesenanschlag has permeated almost every area of our modern lives – even if it never actually happened. And does it matter if it never actually happened? Well, yes it does. Affixing the Theses to the door of the Castle Church, although not a revolutionary act in itself (it was common practice in the University at the time – an invitation to other academics to debate the points raised rather than a rallying cry to the disaffected and downtrodden) was publicly questioning church practices. Writing to his archbishop was raising his concerns privately. All the indications are that he never originally intended the Theses for public dissemination. In this quincentennial year, the market is inevitably awash with books on Luther and the Protestant Reformation. If you only want to read one or two of them … you could do a great deal worse than starting here. Oxford University Press. 2017. ISBN: 978-0-19-968201-0. 256pp. Oh no, I am soooo disappointed that hammering the list didn’t happen, but it does make more sense the way it actually did. I’ve always hated how the Nazis were able to use Luther’s own Anti-Semitic words in their evil doings, that has always been a major flaw in an otherwise decent man who had so many other good ideas. 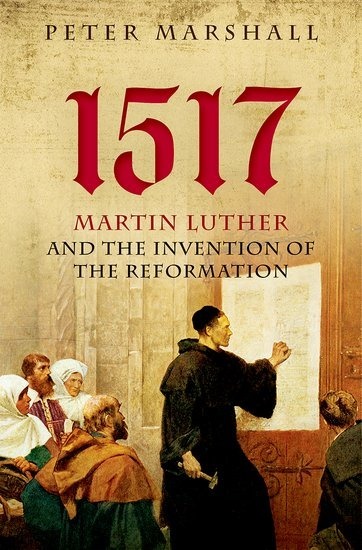 This book will be making it’s way to my reading pile when I find it at my local library and what a terrific way to mark Reformation Day, especially this year. I second this review! It is a strong introduction to the images of the Lutheran Reformation and how they have been shaped by contemporary events over the past 500 years. This sounds well worth reading. I recently read about the ‘Lollards’, proto-protestants who pinned 12 ‘conclusions’ to the door of Westminster Hall in 1395. It would be interesting to see how they and Luther’s ideas were related. This entry was posted on October 31, 2017 by Moira in Entries by Moira, Non-fiction, Non-fiction: biography, Non-fiction: history, Non-fiction: philosophy and tagged 95 Theses, Martin Luther, Protestant Reformation, Thesenanschlag, Wittenberg.